De cust van Barbaria - DONCKER, H.
Title : De cust van Barbaria. Size : 16.5 x 20.9 inches. / 42.0 x 53.0 cm. 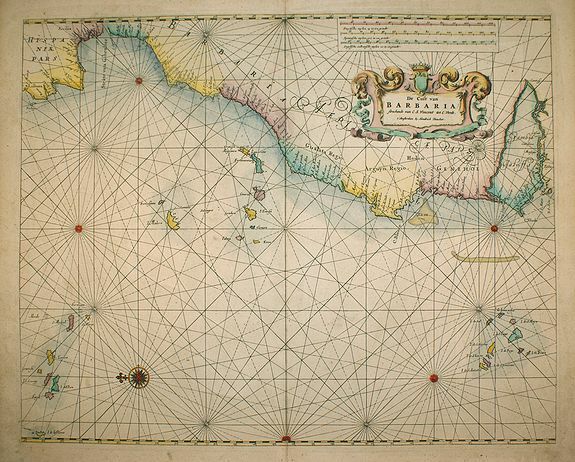 Description :A sea chart depicting the west coast of Africa. Doncker ran a flourishing business in Amsterdam as a bookseller and publisher of sea atlases and textbooks on navigation. Doncker's charts were noted for their accuracy. For many years he collaborated with Pieter Goos and Anthonie Jacobsz in producing a pilot guide, De Zeespiegel. Eventually his stock was sold to Johannes van Keulen.